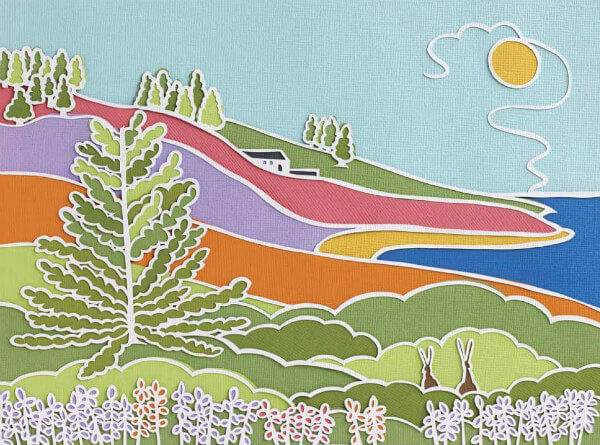 Perhaps you remember artist Sarah King's papercut landscape scenes... colorful and unique, they're hard to forget! 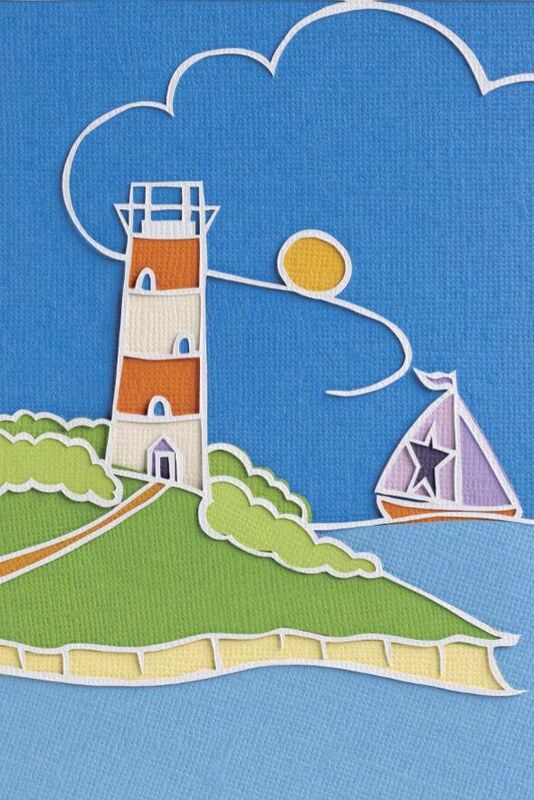 Would you like to create paper cuttings that are equally memorable? 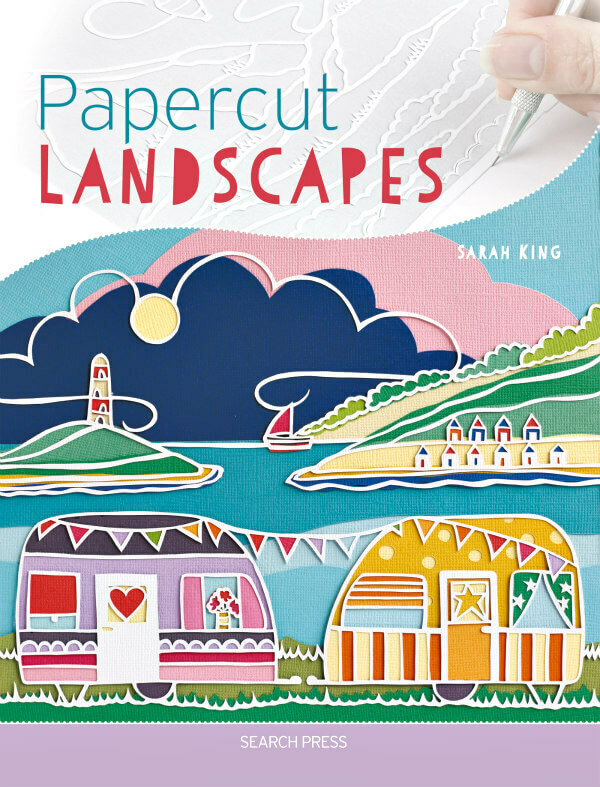 I'm happy to announce that via her new book for Search Press, Papercut Landscapes, you will learn the very process Sarah developed to create such appealing designs. With a short list of supplies - pencil, eraser, craft knife or scalpel, a piece of paper and a cutting surface - plus the templates provided in the book and a certain amount of practice - even beginners will be able to create enchanting scenes just like Sarah's. 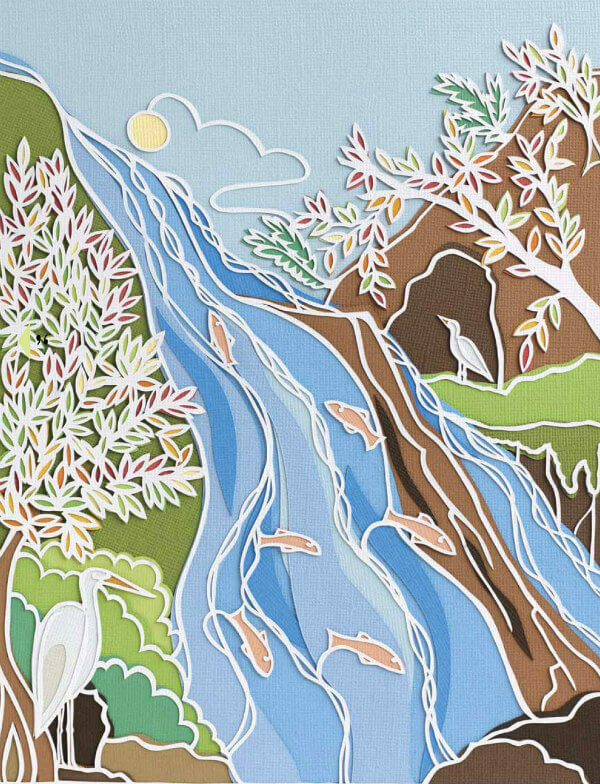 A self-taught artist, she often looks to holiday photos as inspiration for her cheerful papercuts. 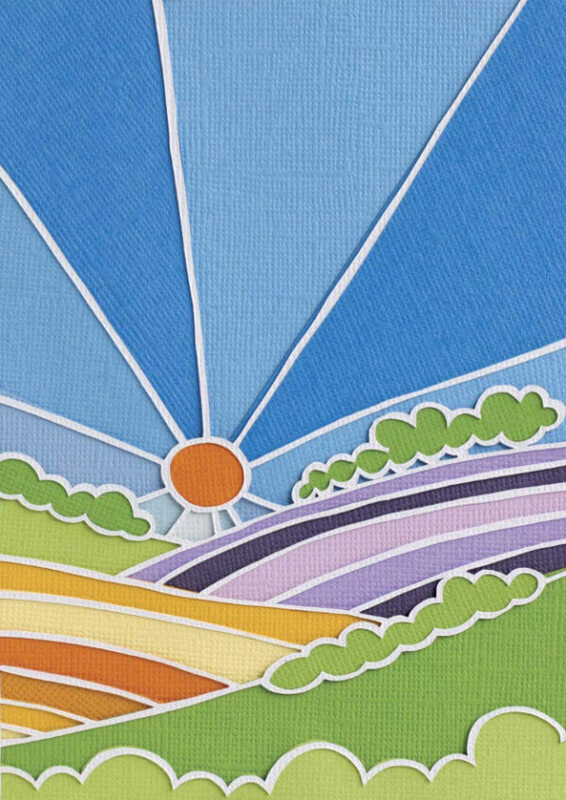 Sarah is a natural born teacher and thoroughly explains the process of creating a drawing, transferring it to card stock, carefully cutting the outline and filling it with layers of colorful card. There are a dozen landscape templates that take you from coast to countryside, and mounting, framing and displaying tips are included too. 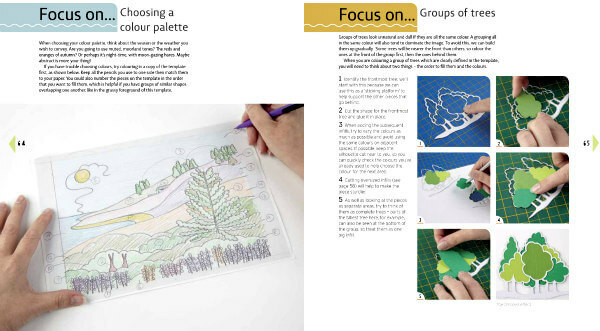 With new skills in place, you'll be able to go on to draw and cut your own delightful designs. The 128 page paperback/Kindle book with 150 illustrations is already on the shelves in her home country of England and will be in U.S. and Canada stores and on Amazon on March 5. It can be pre-ordered now. Author Sarah King of Apple Seed Paper Cuts has an Etsy shop and is on Instagram and Facebook. And now a 3-winner U.S. and Canada giveaway! 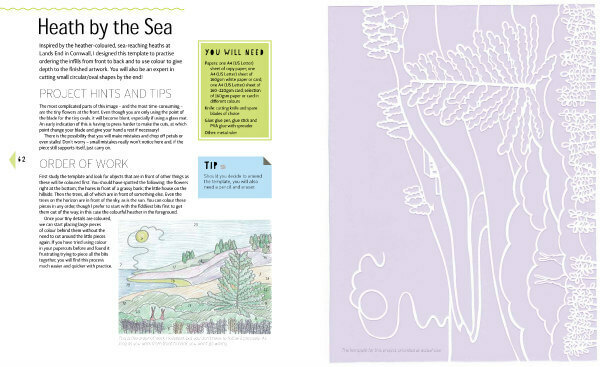 Enter to win an advance copy of Papercut Landscapes by signing up for the Search Press newsletter (green bar, top left of the Search Press homepage) AND by posting a comment below now through Saturday, February 9, 2019. The same giveaway is underway on the All Things Paper Instagram feed. You may enter there too to double your chances. Three winners with a U.S. or Canada mailing address will be chosen at random from combined blog and IG entries and announced at the bottom of this post. Good luck! Beautiful! I have never seen her work before. Simply amazing. Beautiful images! I love to do paper quilling and would love to try this technique too! i started papercutting 2 months ago, and am hooked! your images look challenging but do-able. Never seen such work before. Simply beautiful!! I would love to learn this skill.... and thank you..... I wasn't aware of Search Press! This looks like a terrific book. I’d love a copy! Thanks for the opportunity. I think that I could learn how to do this. The book sounds great. 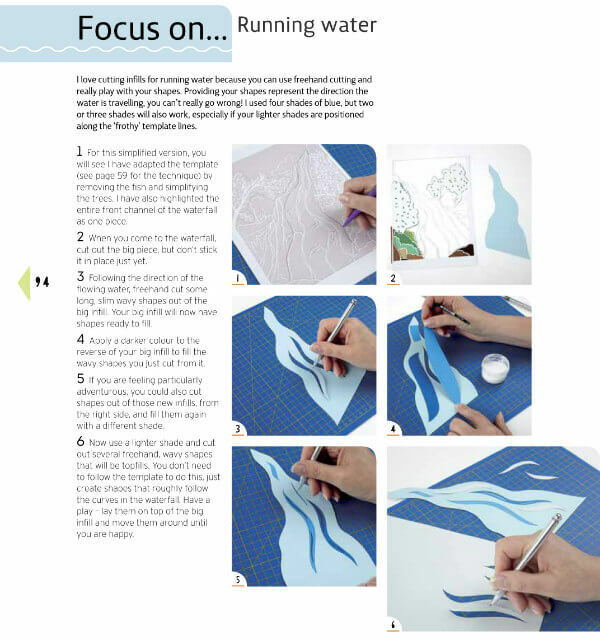 It would be helpful to have her illustrations in front of me while I work on developing skill in paper cutting. Lumber has become so terribly expensive and being on disability with a limited income, I have had to diversify. This cut paper art looks amazing and I would love to give it a try (paper being much cheaper than lumber!). Thanks for this opportunity. I love the simplicity of her designs (valeree47@gmail.com) !! Thanks for your entries, everyone! The giveaway has ended. 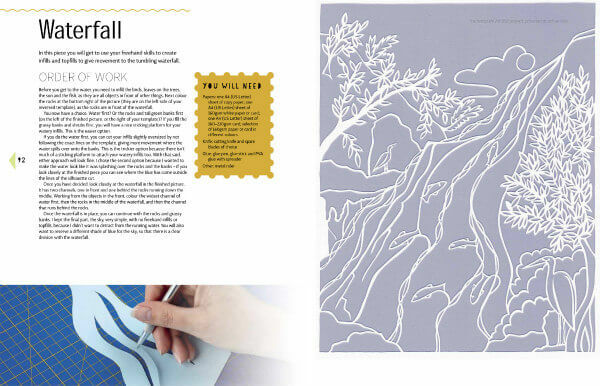 Congratulations to all three winners, I really hope you enjoy papercutting landscapes from my book! Thank you Ann, and Search Press, for hosting this giveaway!